Instance leveling is now the fastest way to get to level 80, and most of the time you’ll be queuing up for random dungeons. 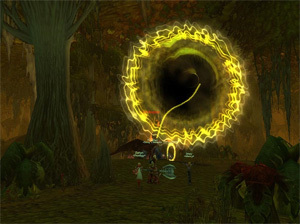 However, sometimes it is helpful to know which specific dungeons to run, so here’s a quick rundown of the best instances by level for the Wrath of the Lich King expansion. Levels 68-71: Utgarde Keep: — Technically the Wrath of the Lich King expansion doesn’t begin until level 70, but you can actually travel to Northrend and queue for instances as soon as you reach level 68. In fact, you’ll find that instance leveling in Utgarde Keep for levels 68-70 will make those two levels fly by in just a couple of runs. This is because the monsters are a much higher level than you, but being in a group with four other people makes it easy to kill them. To queue for Northrend instances when you reach level 68, you’ll first have to make the boat trip to Northrend and then choose to queue specifically for Utgarde Keep. It’s the only Northrend instance you’ll be eligible for. Levels 71-73: The Nexxus – The Nexxus is a very long instance compared to the other level 80 dungeons, but it will certainly give you a lot of experience when you run it between levels 71 and 73. Just remember that the last boss of this instance can be especially difficult because your healers aren’t quite geared enough to heal through the de-buff. Just remember to jump! Levels 73-74: Old Kingdom – Old Kingdom is a relatively easy instance to run, and it will probably keep coming up in the dungeon finder time and time again, so get used to seeing it. Levels 74-76: Violet Hold – You can start queuing for Violet Hold at level 74, although the instance quests for this dungeon don’t become available to you until level 75. Just pick them up right outside the entrance to the Violet Hold instance. Levels 76-78: Halls of Stone – The Halls of Stone is another very popular instance, and you’ll probably see it a lot in the dungeon finder. It’s also very easy to pick up the quests for this in the areas around the instance itself. Levels 78-80: Trial of the Champion – This instance is a lot of fun because it’s quite a bit different than the other instances in the game. The first part of the instance involves a jousting part in which you have to ride horses and knock your opponents to the ground. It’s certainly an interesting experience, although you will have to learn some new skills to complete Trial of the Champion successfully. Once you reach level 80, you can begin queuing for random heroic instances. This completes your instance leveling experience, but it doesn’t mean you’re done. The best way to get geared enough to run higher level 10- and 25-man content like Icecrown Citadel is to do chain heroics, build up badges, and get gear from drops and badge vendors.